Add up the value as you read through this page, and I think you’ll agree that $39/month (or only $399/year) is an incredible price. In addition, it’s ready to go! Mom, you can just print it or even use it straight from the computer. We know you’re busy (because we are, too), and we’re hoping this takes a huge load off your plate. Our prayer is that your family will be equipped to really use the Scriptures as the primary textbook in your home! Our curriculum starts each day with reading and study together of the Scriptures. You can choose from several options, each designed to be done together as a whole family (for any age). Hebrew — Our daily lesson plans are not designed to be a full Hebrew course but rather an introduction to the aleph bet, to copying portions of the Hebrew Scriptures, to basic Hebrew vocabulary words, and to the basics of how to use Hebrew study materials (such as a lexicon). We use various texts (such as Psalm 119) to focus on one letter or concept each week, reviewing it in fun ways each day. Music — Our daily lesson plans are not designed to be a complete musical education but rather an introduction to basic music theory, vocal instruction, and music appreciation. We include styles of music from all over the world, through many time periods, and mentioning many composers, all with a biblical perspective. You’ll learn Scripture songs, folk songs, Messianic songs, and traditional hymns and Christian songs. We occasionally include links to video instruction to help you teach musical concepts to your family. Poetry — Our daily lesson plans focus on one poem each week to introduce your children to styles of poetry from all over the world, both from classic children’s literature and from Scripture. Poems have been carefully chosen to be uplifting and honoring to YHWH. P.E. — Our daily lesson plans include daily stretches and strength-building exercises, as well as instruction about various sports enjoyed especially in the United States. Twice a week, kids will enjoy fun games that can be played indoors or outdoors using simple materials found around the house. One day a week, students will be given reading assignments and discussion topics about various health and nutritional topics. Arts and Crafts — Our lesson plans are very simple, designed to teach an awareness of our Creator’s world and a thankfulness for His majesty, as well as training in how to use crafts to bless and serve others. One artistic concept will be emphasized each week, plus one “ministry craft” for each Torah portion is included. Only ordinary household supplies are needed. Lesson plans are geared for elementary-school ages, with ideas for modifying them for both preschool and teenaged students. 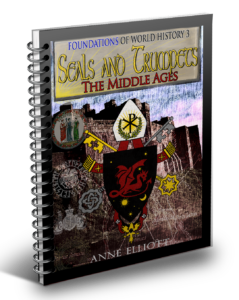 Our curriculum combines grades 4-12 together for history each day. You can choose from several options, each designed to be done together as a whole family, with additional independent reading and writing assignments for high-school students. Geography — In addition to map studies included in our history curriculum, our geography lesson plans will introduce your children to the seven continents, to maps and topography, and to cultures and people groups worldwide. Students will be encouraged to correspond (as pen pals, etc.) with children from other parts of the world. Prayer for the evangelism of the world will be emphasized. Reformation to Modern Times and Government/Economics (high school only) are currently being developed. We are thrilled to use books from Nothing New Press as the spine of our curriculum. Known for their easy-to-read style and their solid basis in Scripture, these award-winning books are fantastic additions to your home library! We have also scheduled topics of discussion to go with each reading. However, don’t feel that you must limit the discussion to only these things! Mom should feel free to stop the reading at any point, to discuss things that she knows are important to her family. Allow the Holy Spirit to guide you as you learn together. During all years of this history curriculum, we will be constructing a timeline. We use dates that agree with biblical history, whether or not they agree with modern historians. We do frequent map studies and recommend various books and notebooking ideas to make and store the maps your children make. Once each week, we schedule a “notebooking” activity that your children can mostly do independently. Provide them with supplies, such as colored pencils, markers, pretty papers, glue, and special scissors. Younger children might want to dictate a paragraph to Mom, which she could then type and print out, to be included in their notebooks. Some families like to have their children notebook several times a day. Other families skip notebooking altogether, just having their children “tell back” (narrate) to them what they have learned. Some activities are simply listed as research projects, such as “Visit a public library or do research online on ancient weapons.” These could be used as notebooking activities, as writing assignments, or as parts of larger reports or projects. Do what works best for your family! High-school students are ready to discuss and interact with many of these topics on a much deeper level than younger students. We recommend that you take many of the weekly notebooking topics and require 2-3 pages of essays from your high school students. You may wish to pose controversial questions of your students and ask them to defend their positions. We have also included additional reading assignments for high school students. Some of these are more difficult than others, so use your discretion in what you require of your own students. Most are available for free online but if your budget allows, consider purchasing hard-copy books, since it will be easier for your student to read, to highlight, and to take notes. Even adults will love this curriculum – we know we did! Take every opportunity to discuss these topics throughout your days and alongside your activities. As adults, stick some of the additional books beside your bed, so you can be reading them, too. You’ll start seeing God’s hand everywhere! Note: Students in 3rd grade or younger will receive quite a bit of history instruction from our “Together School” geography lesson plans. Our own younger children also tend to “listen in” to our world history discussions each day, and we’re amazed how much they learn. However, we don’t feel that formal history instruction is necessary for children younger than 4th grade. 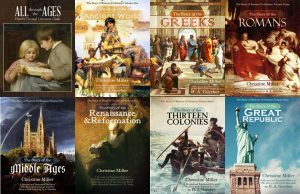 All our members will receive a discount of 10% off any order of history books from Nothing New Press! 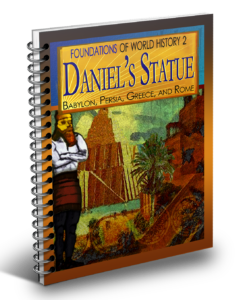 This is a huge help, since additional history books are required for all our history curriculum levels. This is an exclusive benefit for members of HomeschoolingTorah! 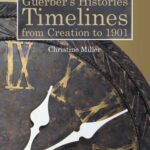 All our members will receive an exclusive ebook of world history timelines, made just for us by Christine Miller of Nothing New Press, and taken from her book, All Through the Ages, and her Guerber history books. 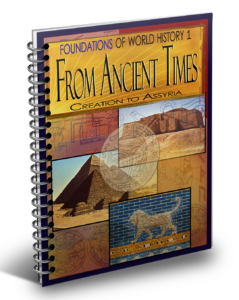 All our members will receive a digital version of Map Trek: Ancient World, from Knowledge Quest Maps, which is a downloadable set of beautiful maps that coincide with Years 1 and 2 of our history curriculum ($14.95 value). Why must we learn to read and write? 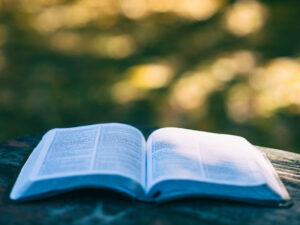 We learn to read so that we can learn the Scriptures, and we learn to write so that we can effectively communicate His life-giving Word to others. Our curriculum combines all ages together for language instruction each day, as much as is possible. Each student will use the Bible as his primary textbook, so you’ll have nothing else you need to buy. Additional independent assignments are also provided for all ages. Copywork — Our lesson plans are based upon the copying of Scripture passages to teach important language skills, including learning to read, handwriting (traditional cursive), punctuation, vocabulary, word usage, and writing skills (see Deuteronomy 17:17-18). All instruction and worksheets are provided for beginning writers, while older students copy directly from their Bibles onto paper or into journals (as you prefer). Phonics — Our “learning to read” program is based upon the Orton-Gillingham approach to phonics. We use the Bible to teach phonics, combining it with the latest research to provide your younger students with a firm foundation in reading. 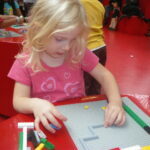 Our method is multisensory (sight, sound, and touch), and phonics concepts are taught in a logical, sequential way. Each lesson builds upon the previous lesson, but Mom remains in charge — helping her child move as quickly or slowly as needed. We believe in teaching “phonograms” so that no guessing is involved. Order and the beauty of language will be emphasized, with lots of opportunity for review and practice each day. Spelling — Our spelling program picks up from our phonics program. 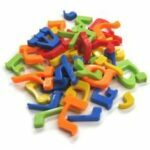 Word lists, teaching suggestions, and spelling principles are provided each week for all levels of ability. Reading — We provide reading recommendations and ideas for literature for your students. We aim for excellent literature that fulfills Philippians 4:8, which states, “Whatever is true, whatever is honorable, whatever is just, whatever is pure, whatever is lovely, whatever is commendable, if there is any excellence, if there is anything worthy of praise, think about these things.” We hate “surprises” in literature selections as much as you do, so we provide discussion starters and warnings about what your students are reading. Vocabulary — We help your students learn the origins of the English language by providing instruction in Latin and Greek roots, as well as the meanings of prefixes and suffixes. Grammar — We learn grammar so that we can express ourselves with manners. In other words, we speak and write with correct grammar so that others won’t be distracted by our display of ignorance. 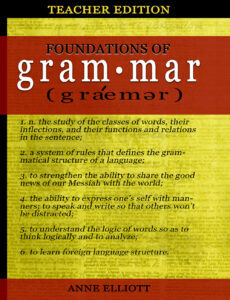 A second reason for learning grammar is so that we can learn to think logically and to analyze. Diagramming is especially helpful for this. Finally, learning English grammar helps us learn foreign language structure. We recommend beginning to teach grammar, with diagramming and logic, around the 5th grade. After a strong unit teaching basic grammar principles, we provide daily review sentences taken from Scripture so that your students won’t forget what they have learned. Because of our unique method, you can teach grammar to all your 5th-12th grade students at one time. Oral Language — Because we are judged by the way we speak, we provide help and guidance with pesky problems such as “lie” or “lay,” and “less” or “fewer.” Your children will really enjoy it, while learning to evaluate and edit both oral and written language that they see and hear. Typing — We provide simple typing instruction, with links to free typing resources online, so that your students will develop speed and accuracy. One of the most difficult parts of language usage is learning to express ourselves on paper. The goal is to be competent at this by the time a student graduates from high school. At that time, you want your student to be able to write a 10-page research paper, a 10-page position paper, extemporaneous essays, and to be introduced to other forms of written communication, such as speeches, teaching lessons to young children, story telling, and poetry. To write a 10-page paper is a multi-faceted project. You must learn to come up with ideas, to research, to take notes, to outline, to consider an audience, and much more. All of these skills can be learned by beginning to write one sentence at a time. 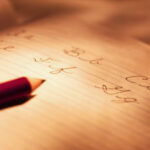 After a student has learned to write one good sentence, he needs to learn how to write one good paragraph. Finally, he needs to write an essay (several paragraphs on a single topic), and only then can he begin to write several pages. Most curriculum moves too quickly through this process. We think it’s wise to move very slowly through this progression, perfecting each stage before rushing to the next. One problem that children have is that they just haven’t lived long enough to have ideas floating in their heads that are begging to come out. For that reason, we believe that the best way to cultivate a good writer is to read good books to our children. The elementary years should be primarily concerned with reading (and possibly journal writing or other practical writing, such as letters to grandmother, recipes, or narration). Young teenagers should then have a unit study on the sentence, followed by a unit study on paragraph writing, then a unit study on essay writing, and then finally a unit study on research and position papers. Allow several years for this and plenty of practice, writing daily or at least several times per week. Be sure his mind is filled with ideas and that he writes about subjects that interest him. Each of these areas are provided for you in our curriculum, with plenty of advice on how to customize your children’s writing instruction. Phonics, reading, spelling, and vocabulary instruction using Scripture. Handwriting and typing from Scripture, until these skills are mastered. 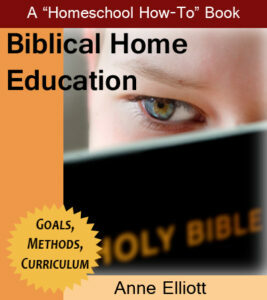 Journal writing from Scripture and discussions in your home. Formal grammar instruction plus grammar and review of proper word usage, using sentences from Scripture. Reading good literature, evaluating it with Scriptural principles. Unit studies on formal writing for older students, combined with daily practice and preparation for the use of writing in service and evangelism. Finally, we include instruction for Mom. Feel a little shaky teaching grammar, phonics, or writing? Don’t worry. Each week includes special helps and even occasional videos just for Mom, so that you’ll learn easy ways to explain difficult concepts. You might find yourself loving these subjects yourself! Together Math Drills — For 3 days each week, all your children will play math games together, do math drills, and enjoy some fun competition. (Only one child? That’s okay! He or she will enjoy doing the drills with Mom!) For the other 2 days, we provide “story problems” from the Bible, such as the size and mass of Noah’s ark, the dimensions of the tabernacle or temple, timelines and dates, the size of people groups, money, weights and measurements, distances between locations, and more. We also study biblical and historical characters who excelled at math, and we learn why YHWH chose to use them for His purposes. Daily Arithmetic Instruction and Review (Grades K-8) — We choose arithmetic “themes” each week so that all your children can be learning similar concepts at once, but we provide daily worksheets and teaching advice for grades K-8 (as well as answer keys for Mom). 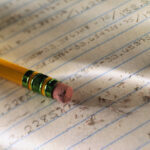 Note for High School Math (Grades 9-12) — We do not currently offer advanced math. We recommend Life of Fred or Bob Jones University Press or Teaching Textbooks for these subjects. FREE Ebook! Taking the Mystery Out of the SAT and ACT, by Lee Binz and Andrew Pudewa of Institute for Excellence in Writing. 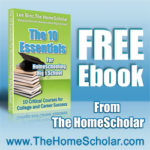 Now you can take the SAT and ACT off your homeschool high school “panic list!” Lee Binz, The HomeScholar, is proud to share this webinar and companion ebook she developed with Andrew Pudewa, Director of the Institute for Excellence in Writing. In these materials, Lee and Andrew share amazing insights and little known secrets to help you prepare your homeschool student for the most important standardized test of their life. 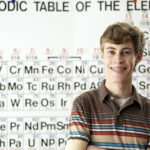 Discover the homeschool advantage in ACT & SAT testing. Learn how to select the test that will make your student look like a genius. Discover which section of the SAT is the most predictive of college success, and MORE! This is one ebook that you will want to print out for future reference. FREE Ebook! 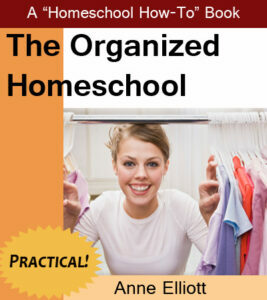 The 10 Essentials for Homeschooling High School, by Lee Binz. 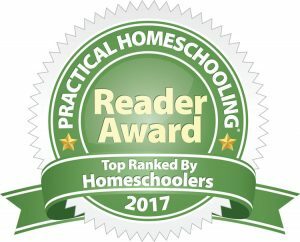 As a consultant to homeschool parents, Lee Binz, The HomeScholar, is often asked what high school topics are absolutely critical for students to study before graduation. Her list of the “10 Essentials” is compiled here to give you the confidence you need in your high school planning. With practical advice and organized presentation, Lee will help you make sure you are covering the necessary subjects to help your students succeed. Learn the essentials of teaching English, math, social studies, science, foreign language, PE, and fine arts. Learn how delight-directed learning can become electives, and how to encourage your children to do their work at the high school level, even during difficult times. FREE Ecourse! A Homeschool Parent’s Guide to High School Grades, Credits and Transcripts, by Lee Binz. 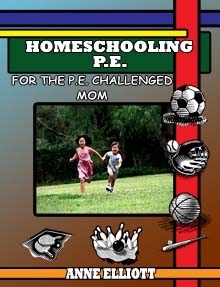 Sometimes homeschooling high school can seem like a long and daunting journey. There are challenges at every turn. How do I evaluate my children? How can I give grades that colleges will believe? 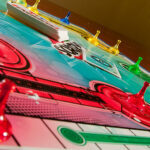 How should I assign credits? Where can I get the answers I need? You don’t have to be frightened, because in this one-hour training webinar I will answer all these questions and ease your fears. This course will cover all the essentials you need to know to calculate credits, determine grades and create your homeschool transcript. In this webinar you will learn 5 sure-fire ways to determine high school credit, how to let go of “grade anxiety,” the 5 killer advantages of a properly-crafted homeschool transcript and 3 transcript pitfalls that can cripple your child’s chances for college admission and scholarships. Learn, enjoy and relax so you feel confident! We believe that Scripture teaches YHWH created the world in six literal, consecutive 24-hour days. We believe that the Flood of Noah’s day was a worldwide, literal flood. It was a significant geological event and much (but not all) fossil sediment originated at that time. We believe that the gap theory has no basis in Scripture. We believe that no apparent, perceived or claimed evidence in science can be valid if it contradicts the scriptural record. Of primary importance is the fact that evidence is always subject to interpretation by fallible people who do not possess all information. In our curriculum, we seek to teach our students to think logically and carefully about the created world. We emphasize the scientific method, which consists of observing (gathering facts), hypothesizing (suggesting explanations), and experimenting (testing explanations). In our curriculum, we teach that science is inseparable from mathematics, which we call the “language of science.” We teach our students to be precise, exact, and careful when interacting with God’s world. In our curriculum, we acknowledge that we are made in the image of a Creator, and we hope to cultivate creativity in our children and constant appreciation of the created world. (We try to avoid the use of the word “nature,” choosing to use the word “creation” instead.) While teaching responsibility and stewardship of God’s creation (Genesis 1:28), we also seek to worship the Creator, rather than created things, in all that we do (Romans 1:18-32). Light, Energy, and Matter (Day 1) — Topics include magnetism, electricity and currents, motion, force, light and sound waves, color, gravity, radiation, electronics. Water and Atmosphere (Day 2) — Topics include water, oceanography, molecules, atmosphere, weather. Land and Plants (Day 3) — Topics include rocks, minerals, elements, chemical reactions, earthquakes, plants, flowers, seeds, trees, fungi, mold, bacteria. Sun, Moon, and Stars (Day 4) — Topics include the moon and moon phases, planets, constellations, eclipses, galaxies, meteors, star clusters, comets, asteroids, calendars, and the study of space. 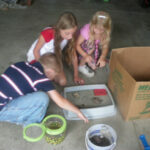 Birds and Sea Life (Day 5) — Topics include birds, fish, amphibians, environmental science. Land Animals and Man (Day 6) — Topics include fossils, reptiles, mammals, insects, invertebrates, classification systems, microbiology, human anatomy and physiology, disease. Each “week” of lesson plans is set up so that 3 days will be spent discussing science topics with Mom, then 2 more days of study, projects, and review can be done relatively independently. Our goal is to allow Mom several days a week of intense study with her children, yet also give Mom a few days to accomplish housework, errands, and other responsibilities. You are always welcome to do more than the curriculum suggests. We have utilized online resources extensively in our curriculum, to save you the added expense of purchasing additional books and materials. You will need Internet access for many of the lessons. We have scheduled topics of discussion to go with each topic. However, don’t feel that you must limit the discussion to only these things! Mom should feel free to discuss things that she knows are important to her family. Allow the Holy Spirit to guide you as you learn together. We provide at least weekly opportunities for science to be “hands on.” However, out of respect for your budget and energy levels, we try to use supplies that are readily available around your home. We do suggest ways to spend time outside observing Creation, but because we ourselves live in a cold climate where we can’t always watch things grow or stay outside too long, we offer other options for families who also have difficulty getting outside at all times of the year or might live in an urban environment. Memorization is an important part of our curriculum, so that students will have a mental “handle” on which they can hang all of the other things they learn. 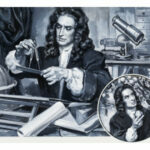 We strongly emphasize the days of Creation on which God made things, and we learn the history of scientific inventions and discoveries. We emphasize especially the Latin and Greek roots of scientific words, to promote literacy and the ability to interact with scientists and academic literature in the sciences. During all years of this curriculum, we will be constructing a science notebook. 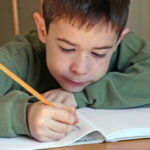 At least once each week, we schedule a “notebooking” activity that your children can mostly do independently. Provide them with supplies, such as colored pencils, markers, pretty papers, glue, and special scissors. Younger children might want to dictate a paragraph to Mom, which she could then type and print out, to be included in their notebooks. Some families like to have their children notebook several times a day. Other families skip notebooking altogether, just having their children “tell back” (narrate) to them what they have learned. Some activities are simply listed as research projects, such as “Visit a public library or do research online on the migration of birds.” These could be used as notebooking activities, as writing assignments, or as parts of larger reports or projects. Do what works best for your family! High school students are ready to discuss and interact with many of these topics on a much deeper level than younger students. We recommend that you take many of the weekly notebooking topics and require 2-3 pages of essays from your high school students. You may wish to pose controversial questions of your students and ask them to defend their positions. We have also included additional reading assignments, research projects, and application activities for high school students. Some of these are more difficult than others, so use your discretion in what you require of your own students. Resources and ebooks are available for free online but if your budget allows, consider purchasing hard-copy books, since it will be easier for your student to read, to highlight, and to take notes. Even adults will love this curriculum – we know we did! Take every opportunity to discuss these topics throughout your days and alongside your activities. As adults, stick some of the additional books beside your bed, so you can be reading them, too. You’ll start seeing the Creator’s hand everywhere! Note: We do not have a separate science curriculum for students in 3rd grade or younger. Our own younger children tend to “listen in” to our science discussions each day, and we’re amazed how much they learn. However, we don’t feel that formal science instruction is necessary for children younger than 4th grade. Instead, our lesson plans will include a simple science discussion topic (with learning ideas) for parents of young children, which we recommend you do with your children each Sabbath day, as you remember that “in six days YHWH made heaven and earth, the sea, and all that is in them” (Exodus 20:11). To train them in orderliness, respect for others, self control, and biblical character — These character qualities form the foundation of everything else in life. The books of Deuteronomy and Proverbs are emphasized, and plenty of advice and help for parents is included in the lesson plans. To give them special time with Mom — Little ones can get left out when life gets busy. Our plans will remind you of priorities of motherhood. You’ll enjoy spending time doing activities with your children, and you’ll cultivate special memories while feeling good that you remembered to teach them important skills and life lessons from Scripture. To help mothers feel less overwhelmed — You don’t have to do everything we recommend, but you’ll probably enjoy having “check boxes” of the common sense things you want to remember with your preschoolers. We even remind you of character qualities you can develop in your own life, such as joy, peace, and contentment. Our lesson plans are based on 5 activities we recommend for preschoolers each day. Please note that we believe in short, easy lessons. Learning Time — We’ll give you short and pleasurable ideas for basic life skills that all preschoolers should learn, from Scripture memory work, ABCs, 123s, telling time, manners, and more. Creative Time — We’ll recommend fun table-time activities your preschoolers can work on by themselves, with you or an older sibling in the room. Building Time — We’ll suggest hands-on playtime activities that will help your preschoolers develop self-control, imagination, and attention-building skills. Outside Time — We’ll recommend ways to encourage your preschoolers to play outside, weather permitting, or at least to get up and moving inside. Rest Time — We’ll give gentle ideas for ways your youngest children can rest, relax, and get away from the over-stimulation that often occurs in a busy, homeschooling household. FREE Music Download! ABC Bible Memory Verse Songs. This 26 KJV-based Bible verse song collection offers an exciting and interactive way for children memorize their ABC Bible verses! 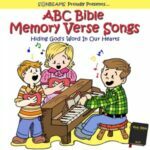 A to Z, the ABC Bible memory verse songs were handpicked for young children and will teach your child important lessons from the Scriptures. You’ll find your Heavenly Father brings the songs to your mind often, even catching yourself singing out loud in the store maybe. One key feature is that you not only memorize the Bible verses, but the references are also included in the songs! FREE Curriculum! 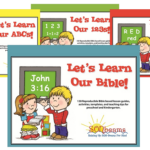 “Let’s Learn Our Bible!” From A to Z and 0 to 25, this provides 26 weeks of lesson plans, activities, printable worksheets and tracing pages for families. Children will learn to relate numbers to creation days and the 10 Commandments, and letters to people in the Bible. In fact, this would be a great Bible study for families with children of many ages. Weekly Teacher Training — We’ll include suggestions and ideas, delivered to your email inbox weekly and taken especially from the books of Deuteronomy and Proverbs, to help you learn how to teach effectively — in the same way YHWH our Father teaches us. You’ll be teaching your children at home with confidence in no time. 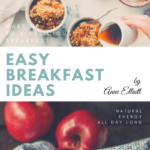 E-books by Anne — In addition, you’ll receive complementary digital copies of books that Anne has written for Foundations Press, which you can read for encouragement at your convenience, at any time. Household Planners — We’ll provide you with suggestions of household tasks that you might want to schedule each week, to help you keep your home running smoothly. We also include all kinds of downloadable forms and planning tools, in a format you can modify and customize for your own home. Chores for the Kids — We have a short chores “curriculum” for your children — and we include fun charts, forms, and teaching ideas — so your children can learn to participate in the smooth running of any household. Our chore system is appropriate for all ages, from your youngest toddlers to your oldest high-school students.